Opened in 1937, the Model Village is a one-ninth scale replica of the heart of Bourton-on-the-Water. It took local craftsmen five years to build, and apart from the houses, shops and churches, it includes a running River Windrush, Bourton's famous bridges and the model of the Model Village itself. The Model Village is a one-ninth scale replica of the heart of Bourton-on-the-Water, containing all the buildings from the Old Water Mill (now the Motor Museum) down to the Old New Inn and the ford. Situated in Rissington Road, the Model Village was created by a previous landlord of the Old New Inn. It took local craftsmen five years to build and was officially opened on the Coronation Day of King George VI and Queen Elizabeth (the late Queen Mother) in 1937. The model village also includes a running River Windrush, the stone bridges for which Bourton is famous, and, of course, the model of the Model Village itself sitting behind the Old New Inn. Both of Bourton's beautiful churches are reproduced in the Model Village and if you stand close enough, you can hear the choir singing. 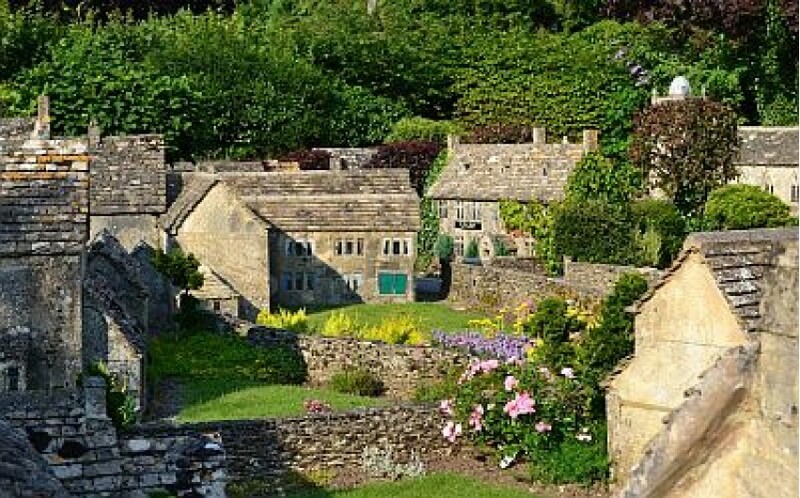 As a replica of Bourton, the Model Village is of particular interest to historians and craftspeople as there are no trains, aeroplanes or gimmicks - it is a perfect replica of the buildings that were in existence in the 1930s and demonstrates how they are used today. Bourton Model Village has always been famous for its miniature bonsai type trees, which are carefully pruned to keep them to scale and the village now features a large range of both deciduous and evergreen miniature trees. The Model Village is of particular interest to both amateur and professional photographers when it is covered in snow. During recent winters when there has been the occasional large snowfall, although efforts are made to keep it open at all times, if the snowfall is actually higher than the garden walls of the Model Village, it has to be closed for health & safety reasons until it can be cleared. There is a small gift shop selling souvenirs. On the same site as the Model Village is Miniature World, a unique exhibition of highly detailed miniature scenes and room sets. These include several moving miniatures. More than 100 of England's leading miniaturist craftsmen and women were involved in the creation of this exhibition. The Model Village is open every day of the year (except Christmas Day) during the summer from 10am to 6pm and winter from 10am to 4pm.